Will any combination of Cyrillic letters suffice when spelling a Russian's name? Does the Russian military prefer to use candles instead of electric lights, and is it possible to reach the Arctic by supercar? If you watch these films again, you'll certainly be scratching your head in confusion. Strange map of Russia. Novosibirsk gets extra letters (Novosyoyrsk), Moscow moved to the Urals, and instead of St. Petersburg we see Petrograd – the city's name in 1914-1924. At headquarters, the Russian military for some strange reason prefers candles instead of electric lights. Again 1914? 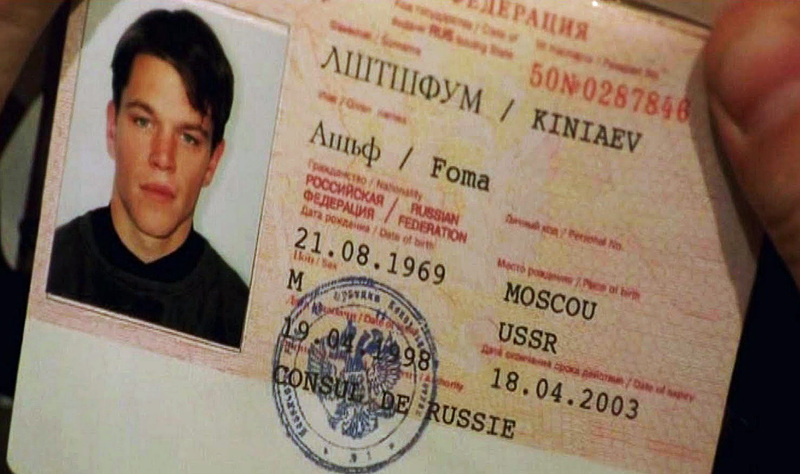 Everything was fine until Bourne found his Russian passport (17 min). In Russian, his name is written as АщьфЛШТШФУМ (Ascshf LSHTSHFUM), which somehow is translated as Foma Kiniaev (yes, an ‘ordinary’ Russian name). Of course, the Russian letters are absolutely meaningless nonsense. In Moscow, Bourne is looking for a girl, and a woman tells him her address – 16 Otradnaya Street. However, if he'd search for the street as it was written in the subtitles, he'd never find it. (1 hour 24 min). The creators of the Fantastic Four movie came up with a fantastic name for the ship – the “Toe head” (Головкапальцаноги) (1 hours 37 min). In the beginning we see the case of John McClane’s son, written in Russian. Again, the Hollywood script writers forgot that in Russia we first write the date and then the month. Then – “Allows passage according to the references available in the document. ” (разрешаетпроходпоссылкам, имеющимсявдокументе). Of course, when making a film about a gorgeous Russian secret agent the producers have to add all sorts of things with Cyrillic titles. But does she really need to keep on her CIA desk a pennant with the words, “To participants in the fighting in Chechnya.” Really? It's strange there were no matryoshkas and balalaikas at her home. (5 min 26 sec). Orlov’s questioning: Vassily instead of Vassilievich (9 min 11 sec). Hollywood still saves money not hiring Russian-speaking advisers. The title at the security monitor is just a random set of letters (4 min 28 sec). It's 2011, but in central Moscow we see an old payphone that costs two Soviet kopeks. (17 min 45 sec, and 19 min 38 sec). Again, thrilling news from Mother Russia. Does anybody know what’s “Red Schuare“ (РедСчуаре)? (36 min 25 sec). We just wonder if all secret suitcases have the words, “Status of the Russia nuclear warhead,” even without its name? Our list ends with this thriller. Does anyone know why the Russian mafia refers to Wick as “Baba Yaga”? Strange that the killer has a nickname of an old fairytale witch that lives in a forest and eats children. Did we miss anything? Write your commentary below!